I got back from Oslo (which was great; thanks are due to my excellent hosts - especially Heidi Lyshol - for a very enjoyable visit) and then had to immediately dive into preparations for the TEDx Cardiff event on the coming weekend. As a consequence I'm still not up to date with everything, but bear with me. TEDx was hugely enjoyable, if stressful. I've talked in public on many, many occasions, both as a scientist and writer, and to audiences large and small. By and large it doesn't bother me, and such nerves as I get before speaking are generally more to do with the nagging background worry of technical problems, rather than the act of standing up and talking itself. As a scientist I used to fret about difficult questions from the audience - the standing joke among astronomers of my acquaintance was that almost any talk could be derailed by someone asking "what role do magnetic fields play in your model/observations?" By and large, though, talking about science fiction is usually much less combative than defending your latest pet model or cherished data set in stellar physics. But TEDx was different. To be honest, TED hadn't been on my radar before I was invited (which shows you how not very plugged in I am, really). 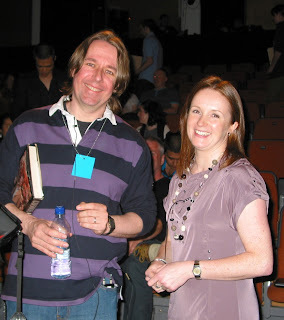 But once I'd agreed to speak at the Cardiff event (TEDx is a series of independently run sessions in the spirit of TED itself) I started encountering it all over the place. There it was in the Guardian. There was Ted Danson talking about it on CNN. My guitar tutor was more clued-up about than I was. And what was clear was that the expected standard of a TEDx talk is very high indeed. Here, for instance, is Janna Levin talking about the soundtrack of the cosmos. Now I don't know about you, but that's just a tad more polished than the average mildly shambolic presentation at your typical science or literary event. TED talks are also supposed to be brief - there's a strict time limit - and very much to the point. No faffing around, no meandering digression. I generally speak for 30 - 45 minutes, which is more than enough time to pull things back on course if they start to drift. No such luxury with TED. You've got to nail it, and you've got to plan it almost to the second. Once I'd honed in on my subject, I spent two days cutting and cutting until I felt it was easily short enough to fit into my allotted 18 minutes. And yet, I still kept running over-length. I cut and cut again, and when I had it down to 16 minutes I ran it past my wife. I then cut it a bit more and after two further rehearsals I managed to deliver my piece in 15 minutes 30 seconds, both deliveries running within a few seconds of each other. I also learned it off by heart - I didn't want to be referring to notes, or cluttering my slides with bullet points. Despite all that, I still went a little over-length on the day itself. I'm guessing the mere act of standing up in a big room, and being able to walk around, slowed me down a little more. But, I think it was OK - the reaction seemed good, and it was clear that people had found all the day's talks really stimulating. For me, it was a blast, albeit a nerve-racking one. I was on at the end so I couldn't really relax until I'd done my stint. But that didn't stop me enjoying the other presentations, all of which gave me something to think about afterward. I'd like to thank Claire and Neil for having me, and after all that I'm pleased to have TEDx very firmly on my radar for the future. Here's me with Tori James, the first Welsh woman to climb Everest. Given my avid interest in armchair mountaineering, meeting Tori was a real thrill. In other news, today is the announcement for the long list of the Wales Book of the Year, and I'm delighted to report that Terminal World has made the cut. Yes, this is a high profile literary award, with a substantial prize and "proper" books on it, and there's also a big, chunky, unabashed science fiction novel in the running. Speaking for myself, I'm mortally sick of the endless in-genre hand-wringing about the perception of SF beyond the so-called ghetto. Granted, the Booker may still be hostile or indifferent to science fiction, but isn't there abundant evidence elsewhere that many, many people just don't really care any more? Last year I was invited to speak on the subject of the recycling of mythology at an English Lit conference, and guess what? I didn't detect one note of disdain from anyone I met, only a general open-mindedness and curiosity. Anyway, I'm thrilled with the long-listing. 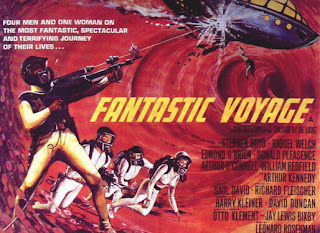 While I'm in Oslo, here's a short essay I did for the BSFA on the film "Fantastic Voyage". Its many flaws notwithstanding, I've always greatly enjoyed this film. It may well have been the first piece of cinematic SF I encountered - if it wasn't Fantastic Voyage, then it would have been another guilty pleasure, George Pal's 1960 version of The Time Machine. Both films loomed large in my childhood and their occasional appearance on television was always a source of delight. Fantastic Voyage was directed by Richard Fleischer and released in 1966. The film embodies a wonderful premise: the US and the Soviet Union have developed secret miniaturisation technology, with the result that people and machines can be successfully shrunk to microscopic size for a period of exactly one hour. A defecting scientist, Benes, has developed the means to prolong the process, but after a failed assassination he develops an inoperable brain clot. After an excellent title sequence, we are introduced to the pilot of the submarine who is tasked to convey his miniaturised colleagues to the site of the clot, where it can be burned away using a laser gun. Played by Stephen Boyd, the pilot knows nothing of the covert organisation behind the miniaturisation technology, but he quickly accepts the reality of it. We are then introduced to the crew of the submarine Proteus as they familarise themselves with the vessel and prepare to be shrunk and injected into the comatose Benes. The film's slender plot hangs on the fact that the enemy may have planted a saboteur on the sub, intent on preventing the operation from being carried out successfully. Donald Pleasence, who plays the saboteur, may seem too obvious a choice, but in 1966 he was still a year away from playing Blofeld. It scarcely matters, in any case: the film's pleasures have little to do with the cold-war mechanics of the story (the characters are at best sketchy), and everything to do with the awesome burden of the surgical rescue mission, and the degree of seriousness with which the film handles its conceit. A good part of Fantastic Voyage has already elapsed before the Proteus enters Benes. The top-secret CMDF HQ is as impressive an underground facility as Blofeld, or indeed any self-respecting Bond villain, could wish for, complete with electric carts and underground traffic cops. Once the crew are secured aboard their vessel, the miniaturisation process is completed and the submarine is injected into Benes' neck. The sequence of the craft rushing down the long metal tunnel of the hypodermic needle is particularly striking. The rest of the film documents the crews' efforts to forge their way through Benes' body. Things soon go wrong and the Proteus has to take a hazardous - and picturesque - detour. The effects are appropriately trippy, not particularly convincing as a depiction of the interior of a human body by 2009 standards but not awful by any means, and with an integrity that wouldn't necessarily be bettered by CGI treatment. Eventually the laser, or "lacer", as it is pronounced by all in the film, is used to zap away Benes' blood clot and the identity of the saboteur is revealed. The submarine is disabled and the remaining crew escape by other means. The much-vaunted logical flaw, in that the abandoned submarine ought to kill Benes when it resumes normal size, doesn't seem to be much of a problem to me. The film establishes that the submarine will be attacked and digested by antibodies long before it poses any threat to Benes. Granted, its atoms will still be inside him, but the film is so murky on the physics of the shrinking technology that for all we know, the atoms will be assimilated harmlessly. For me, the best part of Fantastic Voyage is its sense of authenticity. The shrinking process is handled with superb conviction and an almost magisterial slowness. Stage by stage, the Proteus is shrunk, placed in water and then inserted into a syringe ready for injection into the patient. Remarkably, the film spends more than twelve of its hundred minutes merely getting the Proteus into Benes. The shrinking process is shown to be highly technological and proceduralised, much like a spacecraft docking or H-bomb test. Whatever happens afterwards, the film achieves a considerable pay-off in taking its time here. We believe, at least temporarily, that if this absurd feat were possible, this is exactly how it would be done. It's difficult to believe that a modern version of Fantastic Voyage would have the same faith in its audience's attention span.